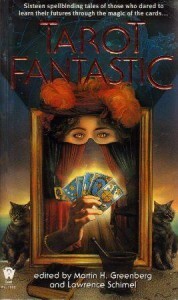 “Solo in the Spotlight” is just one of 15 great short stories (and one poem) in an anthology called Tarot Fantastic (DAW Books, 1997) edited by Martin H. Greenberg & Lawrence Schimel. Some are funny, some serious, but the Tarot use throughout is VERY well thought out. If you are even remotely interested in Tarot, this book is highly recommended. This entry was posted in Book Reviews and tagged anthology, science fiction, tarot on January 17, 2016 by Angela Korra'ti. There are certain books out there, that when we read them change us forever. In my case “The Moon is a Harsh Mistress” was the first to change my worldview forever. The story is of a one-armed computer tech, a lovely provocateur, an absent-minded professor and a sentient computer that is starved for attention. Mix these elements together, add an unjust way of life, a dictatorial ruler and place all of the above in a man-made cave in the Moon and you have one of the best novels ever written. All in all, I found the characters to be rich and well rounded. The character of Mike (also known as the H.O.L.M.E.S. IV computer, Adam Selene, Simon Jester, etc.) is one of the best non-human characters that I have seen in a work of science fiction. Manuel Garcia O’Kelley Davis is perhaps the embodiment of a person caught up in events but not overwhelmed by them. Wyoming Knott adds the right blend of determination, stubbornness, and youthful innocence to this human drama. And last but hardly least is Professor Bernardo de la Paz, a grandfatherly old man who has the only real experience in dealing with the events of the story. The base plot has all of these widely different characters forming an alliance to overthrow the tyrannical government of the Moon. The details of planning a revolution are so convincing that I would not only recommend this novel for entertainment but also as a guide for overthrowing a small country. If you have an afternoon or two free I recommend checking this book out. I don’t think you’ll be disappointed. This entry was posted in Book Reviews and tagged robert a. heinlein, sf, the moon is a harsh mistress on January 16, 2016 by Angela Korra'ti.